Automated sample storage systems are computer controlled storage devices used for the preservation of samples such as chemical compounds and biological samples. These systems help laboratory facilities store and retrieve samples efficiently as and when required. The sample storage systems vary from manually controlled, relatively simple and small storage operating devices to large computer controlled automated storage devices. Automated sample storage systems help reduce labor costs and lower essential workforce requirements, improving workplace safety and taking personnel out from difficult working conditions such as cold storage environments. These systems also help in improving space utilization and increasing storage density, both horizontally and vertically. Nowadays, long-term automated sample storage systems are a requirement for almost every research laboratory. Therefore, this sector has raised the opportunity for business investment. A large number of samples can be stored at individual biobanks with the help of automated sample storage systems, instead of installing devices in separate institutes at the regional and national levels. This is likely to drive demand from the automated sample storage systems market in the 2017-2025 forecast period. The global automated sample storage systems market is expected to rise from US$617 mn to close to US$2 bn over the 2017-2025 forecast period, exhibiting a robust 15.5% CAGR. The automated sample storage systems market is segmented by product type, application type, capacity, end user, and region. Based on product type, the automated sample storage systems market is segmented into systems units and reagents and consumables. The reagents and consumables segment dominates the global automated sample storage systems market, accounting for the largest market share in 2016. The segment is anticipated to dominate the automated sample storage system market during the forecast period owing to increasing demand and adoption of automated sample storage systems worldwide. Based on application type, the automated sample storage systems market is segmented into biological sample storage and compound storage. The biological sample storage segment accounted for largest market share for automated sample storage systems in 2016 due to increasing adoption of automation by biobanks and research laboratories. Based on capacity, the automated sample storage systems market is segmented into less than 100K samples, 100K - 500K samples, 500K - 2M samples, and more than 2M samples. The less than 100K samples segment accounts for the largest share in the automated sample storage systems market due to the high demand for small capacity storage systems from biobanks and research laboratories. Based on end user, automated sample storage systems market is segmented into pharmaceutical and biotech companies, academic research labs, private biobanks, and others. Pharmaceutical and biotech companies accounted for the largest market share for automated sample storage systems in 2016 due to increasing demand for compound storage in drug discovery application from pharmaceutical and biotech companies. The growing government support to drug discovery programs in developed Western economies is thus likely to remain a key driver for the global automated sample storage systems market in the coming years. The global automated sample storage systems market has been segmented into five major regions, namely, North America, Europe, Asia Pacific, Latin America, and the Middle East and Africa., which are further categorized into various countries under each region. Europe dominated the global automated sample storage systems market in 2016 owing to high demand of automated sample storage systems in the region. The Europe automated sample storage systems market was valued at close to US$210 mn in 2017, and is likely to more than triple in valuation over the 2017-2025 forecast period at a steady 15.3% CAGR. Asia Pacific is projected to constitute the highest growth rate over the forecast period owing to increasing adoption of automated sample storage systems among contract research organizations, research laboratories, and biobanks in the region. The regional market’s projected 19.4% CAGR is expected to propel the market from a 2017 valuation of US$119.5 mn to a 2025 valuation of US$493.5 mn. Brooks Automation, Inc. dominated the global automated sample storage systems market in 2016. The major factors responsible for its dominance are widespread market presence, innovative product catalog, and huge investment in R&D. 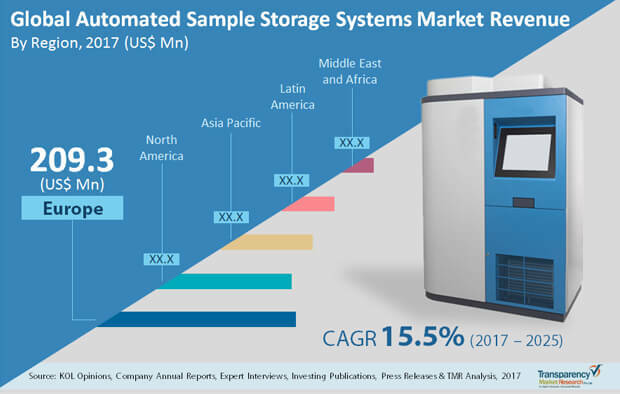 Other major players in the automated sample storage systems market include TTP LabTech, Thermo Fisher Scientific, Inc., Angelantoni Life Science, LiCONiC AG, Panasonic Healthcare Co., Ltd., Biotron Healthcare, Haier BioMedical (Haier Group), ASKION, and Tsubakimoto Chain Co. This report on the global automated sample storage systems market analyzes the current and future prospects of the market. The report comprises an elaborate executive summary, including a market snapshot that provides overall information of various segments and sub-segments. The research is a combination of primary and secondary research. Primary research formed the bulk of our research efforts along with information collected from telephonic interviews and interactions via e-mails. Secondary research involved study of company websites, annual reports, press releases, stock analysis presentations, and various international and national databases. The report provides market size in terms of US$ Mn for each segment for the period from 2015 to 2025, considering the macro and micro environmental factors. Growth rates for each segment within the global automated sample storage systems market have been determined after a thorough analysis of past trends, demographics, future trends, technological developments, and regulatory requirements. A detailed qualitative analysis of factors responsible for driving and restraining market growth and future opportunities has been provided in the market overview section. This section of the report also includes market attractiveness analysis that provides a thorough analysis of the overall competitive scenario in the global automated sample storage systems market. Market revenue in terms of US$ Mn for the period between 2015 and 2025 along with the compound annual growth rate (CAGR %) from 2017 to 2025 are provided for all the segments, considering 2016 as the base year. Market size estimations involved in-depth study of services and product features of different types of services. Additionally, market related factors such as Biobanking Efficiency & Cost Cutting, Growing demand for biological samples from researchers, and Outsourcing of biobanks have been taken into consideration while estimating the market size. The automated sample storage systems market has segmented into four categories, namely by product type, by application, by capacity, by end-user and by region. Geographically, the global automated sample storage systems market has been segmented into five regions: North America, Europe, Asia Pacific, Latin America, and Middle East & Africa. In addition, the regions have been further segmented by major countries from each region. These include the U.S., Canada, the U.K., Germany, France, China, Japan, India, Saudi Arabia, UAE, Brazil, and Mexico. The report also profiles major players in the automated sample storage systems market based on various attributes such as company overview, financial overview, SWOT analysis, key business strategies, product portfolio, and recent developments. Key companies profiled in the report include Brooks Automation, Inc., TTP LabTech, Thermo Fisher Scientific, Inc., Angelantoni Life Science, LiCONiC AG, Panasonic Healthcare Co., Ltd., Biotron Healthcare, Haier BioMedical (Haier Group), ASKION, and Tsubakimoto Chain Co. and others.